A man who helped out a fellow motorist during last week's snowstorm needs his eyeglasses back. Roger Desveaux, a Christian Community Outreach worker, stopped in Dartmouth near Mic Mac Mall to clean the slush off his wipers during the height of the Wednesday afternoon storm and noticed a woman had also stopped. Her wiper was broken. "So I said to her, 'No sweat', I said, 'I'll help you,'" says Desveaux. So he set to work helping her out. 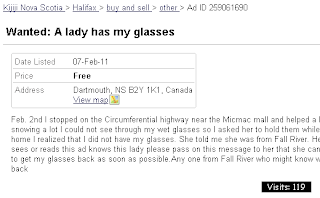 His glasses got wet and foggy and he asked the woman hold them for a moment. Good deed done, they parted ways. "Start my truck and I just go to start and I think, oh, my glasses, gee," he says. "And I think oh, no. I don't have my glasses! She has my glasses!" Roger's a friendly fellow, though, and had learned the lady's name was Margaret, and she was driving her gray car home to Fall River.